Do you love writing as much as you love travelling? Do you want to learn all about content management, digital communications and search engine optimization (SEO)? Do you want to work in Haarlem, 15 minutes from Amsterdam city centre? We thought so. Come and be part of our team. As Content & Communications intern you will support our team of Content Specialists in their daily tasks and you will be in charge of creating content for our label HolidayParkSpecials.co.uk. During your internship you will write inspiring texts for our website and travel blog, as well as social media accounts. Want to know more about being a content marketing intern at BookerZzz? Read here the blog from one of our interns Gizem. Supporting our team of international Content Specialists in their daily tasks. How to work with various content marketing tools, including Content Management Systems, Photoshop and a number of SEO tools. An internship at BookerZzz means getting experience in an innovative, dynamic and fast- growing company with mostly young colleagues. Our corporate culture is informal and result oriented. In addition of gaining work experience, you will get the opportunity to develop a broad perspective in e-commerce and we offer you a wide view in the world of Analytics, IT, Marketing & Sales. At BookerZzz, we want you to grow! That’s why we value people with a strong motivation and ambition to become better at what they do. You should have a positive working attitude; a “yes, we can” mentality and outstanding communication skills. You are not afraid to ask questions and to share your ideas with us. You already live in the Netherlands or are willing to move here. BookerZzz is an e-commerce company in tourism that offers consumers the best short stays in Europe. Through 12 websites in 8 different countries, we offer deals for more than 5,000 hotels and over 700 holiday parks. Thanks to our customer orientated approach, we help more than 1,000,000 happy customers per year to experience their perfect stay. Our Mission: provide our guests with the perfect stay with more value for money, hassle free. Does that sound like an organization you would like to contribute to? Please feel welcome to visit us for a cup of coffee at our office! 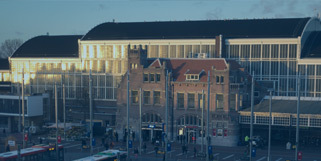 Our office (HQ) is located directly in the city center of Haarlem, just next to the central station, only 10 minutes by train from Amsterdam. We recently moved! See the pictures and read the story of our new office. A healthy and social working environment including fresh fruit, weekly office drinks and lots of social activities. Are you interested in this position? We are looking forward to receiving your CV and a letter of motivation through the ‘apply button’. Convince us that you are the right person for the job! If you have any questions about this vacancy, you can get in touch with our Corporate Recruiter Ymke via phone or WhatsApp via: +31 6 638762512. In order to speed up the process, we prefer applications from EU/EEA citizens, not in need of a working permit for The Netherlands.